Catalign Quarterly is an attempt to put together insights relevant for fostering a culture of innovation in organizations. This is a first such issue. There are five articles in this issue. The first two articles are insights from guest speakers at our innovation management workshop at IIMB last October. The first article summarizes how innovation program at Tanishq evolved over the last 7 years. The second one presents insights from Cognizant on how to build creative confidence. The third article is an inspiring narrative from Gyanesh Pandey, CEO of Husk Power Systems which is electrifying rural India (HQ in Bihar). Then there is a review of an excellent book called “Where good ideas come from” by Steven Johnson. Finally, we have the latest benchmark data on the idea management systems from INSSAN (Indian National Suggestion Scheme Association). Idea management systems exist in the organizations at different levels – process improvements (kaizen), new product development (NPD), new business development (NBD), Intellectual property management (IPR) etc. Indian National Suggestion Scheme Association (INSSAN) has been benchmarking the suggestion schemes in primarily manufacturing sector for the past 20 years. 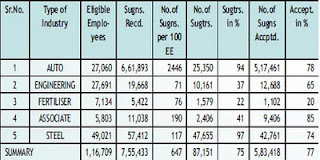 The latest bulletin (Sept-Oct 2011) presents the benchmarking data from 27 organizations for financial year 2010-11 – Automotive (6), Engineering (6), Fertilizers (7), Associated (6) and Steel (2). Mr. Sudhir Date has presented the highlights in the bulletin (pg 14). As discussed in an earlier article, I try to view the innovation metric from following three perspectives: (1) idea pipeline (number of ideas & participation of employees) (2) idea velocity (rate at which ideas move forward) (3) batting average (net potential impact in savings / revenue). Let's apply this lens to the INSSAN 2011 data. Idea pipeline: Ideas per person per year is an excellent proxy for idea pipeline. For the past few years TVS Motor consistently stands out for ideas per person per year metric. On an average, a TVS employee gives a suggestion almost every week (46 in a year) as compared to India average of once in 2 months (6.5). India average has been hovering around 5-6 for the past 5 years. 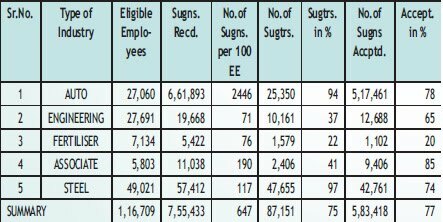 Participation percentage varies from 22% in Fertilizer sector to 90+% in Steel and Auto sectors (see figure below). Steel and Auto sectors were the first in India to embrace suggestion schemes. So this is not surprising. More the participation, more sustainable is your process. Idea velocity: Unfortunately we don't have a good data on this. Lowest lead time for evaluation of suggestion is definitely an indicator and Maruti’s performance of 2 days is commendable. However, we don't have average data on this and we can guess why. Batting average: Suggestion schemes measures the impact primarily through savings. Savings per accepted suggestion is a good indicator. India average of Rs.19,681 makes a good case for running the suggestion schemes. On an average 70% of the suggested ideas are implemented and that looks pretty healthy. Following table shows the data sector-wise. Let’s hope we get similar data for other types of idea management systems in India as well. 1. Adjacent possible: In the year following the 2004 Indian Ocean Tsunami, the Indonesian city of Meulaboh received eight incubators from a range of international relief organizations. By late 2008, when an MIT professor name Timothy Prestero visited the hospital, all eight were out of order – due to power surges, tropical humidity and lack of expertise to repair them. Prestero is an expert on robust designs and the founder of Design that Matters organization. He realized that designing an incubator in developing country wasn’t just about creating something that worked. It was also a matter of something that could be maintained by local people. Rosen, a Boston doctor, observed that small towns in Indonesia were able to repair the Toyota 4Runners. So Rosen approached Prestero with the idea: What if you made an incubator out of automobile parts? That is how NeoNurture incubator was born. It was doubly efficient because it tapped both the local supply of parts and the local knowledge of automobile repair. Johnson observes that good ideas are like the NeoNurture device – they are inevitably constrained by the parts and skills that surround them. That is why encouraging prototyping is so important because it validates if we know what kind of spare parts to look for and whether we have the skills to put them together. Charles Babbage designed a programmable computer in 1837 but couldn't build a prototype in his lifetime (died: 1871) because the spare parts were simply not available. It wasn’t an “adjacent possible” idea for the time. Do you encourage prototyping? Do you make spare parts easily accessible? 2. Slow hunch: Charles Darwin wrote about his moment of epiphany on September 28, 1838 when he conceptualized the famous theory of natural selection. However, more than a century later, when a psychologist Howard Gruber went through the copious notes that Darwin had kept he realized that Darwin had been working on the key concepts from 1837 onwards. Sir Tim Berners-Lee designed the first prototype for sharing information with hypertext in 1980 at CERN. However, it is only in 1989 that he submitted the proposal for building world-wide web. The first web-site was build at CERN and put online on August 6, 1991. Good ideas are more like slow hunches. They often mature by stealth, in small steps and fade into view. Does your organization encourage working on hunches? 3. Exaptation: What is common between the two innovations: Printing press and Jaipur foot? Both took a set of mature technologies in one domain, combined them to solve an unrelated problem. Exaptation is a trait developed in an organism optimized for a specific use but then it gets hijacked for completely different function. Johannes Gutenberg used the screw press technology used for making wines and made modifications to the metallurgy behind the movable type system to create a printing press. In case of Jaipur Foot, Dr. Promod Sethi and Ram Chandra a doctor-sculptor team looked at the retreading of a truck tire with vulcanized rubber in a roadside shop and applied it to create prosthetic legs – what is popularly known today as Jaipur foot. Does your organization create a space for the "doctors" & "sculptors" to come together? Or does your organization encourage Chandras to visit new places like “cycle shops”? I highly recommend this book for anyone interested in finding out “Where good ideas come from?” I am sure you will get a fresh perspective. When you ask the question, “How many of you are creative?” to either students or employees in India, very few, perhaps only 20%-30% of people typically raise hands. Why is that? There is a school of thought which says that it is primarily a confidence problem. Ability to be able to speak up your idea in a meeting with managers / senior managers without fear of failure / ridicule is what is called “creative confidence”. Mr. Sukumar Rajagopal, Senior Vice President, Chief Information Officer and Head of Innovation at Cognizant, shared his insights on how to build creative confidence based on his experience of running a managed innovation program at Cognizant. He was one of the guest speakers at our workshop on innovation management at IIMB last month. How do you build creative confidence? Let’s look at a few of the insights Sukumar shared. Organizations need all kinds of innovations: breakthrough, enhancing, sustaining etc. However, if you want more people to feel confident about how they can contribute to innovation, then breakthrough innovation is not the right place to focus. Why? First, breakthrough innovations are rare, they don’t happen very often. Second, breakthrough ideas create cognitive dissonance and hence early reactions are usually negative (see a study from Cornell). Robert Goddard, the father of modern rocketry was ridiculed in New York Times in 1921, “Professor Goddard does not know the relation of action to reaction and seems to lack the basic knowledge ladled out daily in high schools”. Note that this does not mean that breakthrough innovation is not important. When people suggest ideas related to areas where they don’t have any control, then most of them get ignored. This leads to frustration. Lack of empowerment to experiment is a major hurdle in moving ideas forward. Hence, ideas within your own area of work are excellent candidates where the employees can experiment without asking for anybody’s permission. Perhaps one can fail and still continue without worry of any punishment. If you want people take your big idea seriously, you need credibility. How do you build credibility? One way to do it is by implementing small ideas first. If you say that over the last year I have implemented 7 ideas, chances are high people might take your potentially big idea seriously. When we go to people and say, “Give me all your ideas”, we will be inundated with thousands of ideas like “Cafeteria food should be like this” or “Give all of us laptops”. These ideas don’t go anywhere unless they address problems that have stakeholders and sponsors. And when nobody looks at your ideas, the idea authors will get frustrated. Hence it is better to launch idea campaigns with sponsored challenges and make sure that you will implement top 5 / 10 ideas. Sukumar derives a lot inspiration from Toyota’s kaizen, a system through which employees implement millions of ideas every year. Percent of people who have submitted one or more ideas last year is a good indicator of the creative confidence in the organization.